Stop wasting hours checking and re-checking a spreadsheet's inputs, calculations and outputs for errors and formula accuracy. Figure out a model's structure and use of formulas at a click of a button. Make sure you don’t miss important information. Also, compare spreadsheet versions. Mitigate risk. Confidence in the model means confident decisions. Get a summary of your entire workbook. If you’re building a spreadsheet, reduce the risk of error before releasing your model. 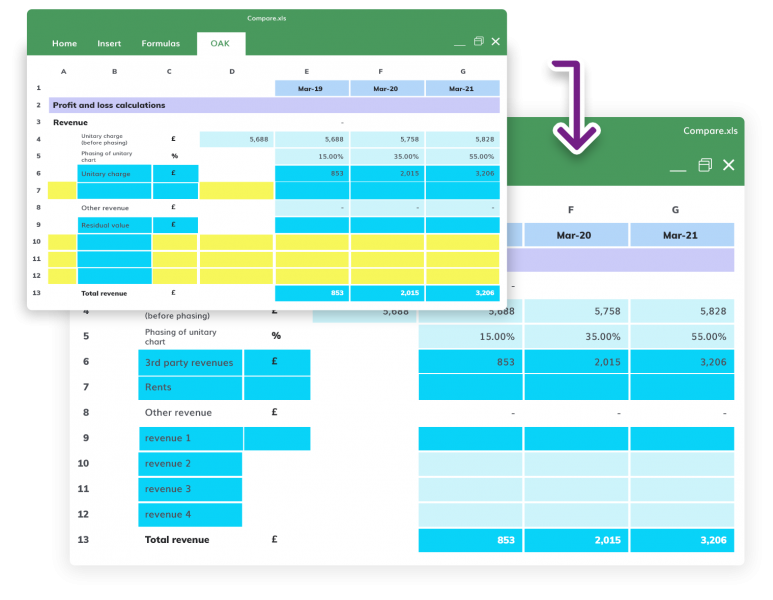 If you’re reviewing or reading and interpreting a spreadsheet, get an overview of the logic behind the structure, layout and formulas. Also detect errors. Model summary: identify critical contents such as the number of formulas, constants, errors and very hidden sheets. Summary of distinct formulas: extract a list of all formulas, the number of times they occur and their complexity. Summary of referred constants: easily locate constant cells used in formulas. Summary for cross-reference: visualise the number of links between worksheets. Risk analysis report: efficiently identify more error-prone formulas with a list of formulas scored by risk. Need a quick and efficient way to audit a spreadsheet? With a graphical map of the structure of the sheets in your workbook, you can quickly understand the logic behind a worksheet and check for errors and inconsistencies. 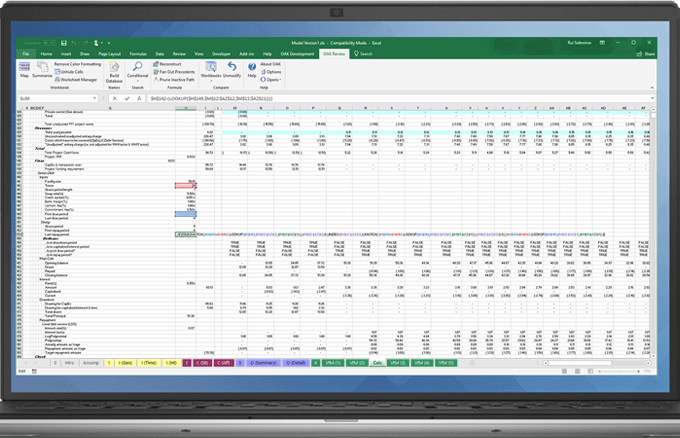 Get a foolproof way to find differences between two spreadsheets. Also the differences between worksheets within a single spreadsheet. Easily distinguish concrete changes from those that occur as a result of items changing position. Understand, examine and debug formulas in a model. Reconstruct a formula: deep dive into a formula and see its construction from root level. Prune inactive cells: make it easy to understand calculations. Filter out inactive elements. As a result focus on active elements. Fan out precedents: quickly figure out the differences between two formulas with a feature that lets you trace precedents of both. 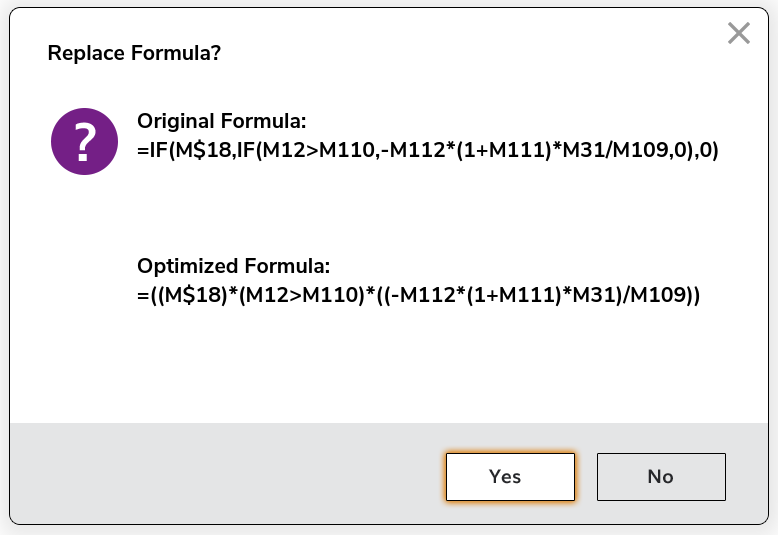 Optimize formula performance: get recommendations for reconfiguring formulas so that they are clear and concise. With OAK, you can apply a series of 50 simplification rules to any formula. Primary error cells – quickly identify the cells from where am error originates. Constant formulas cells – find formulas which make no reference to other cells as precedents. 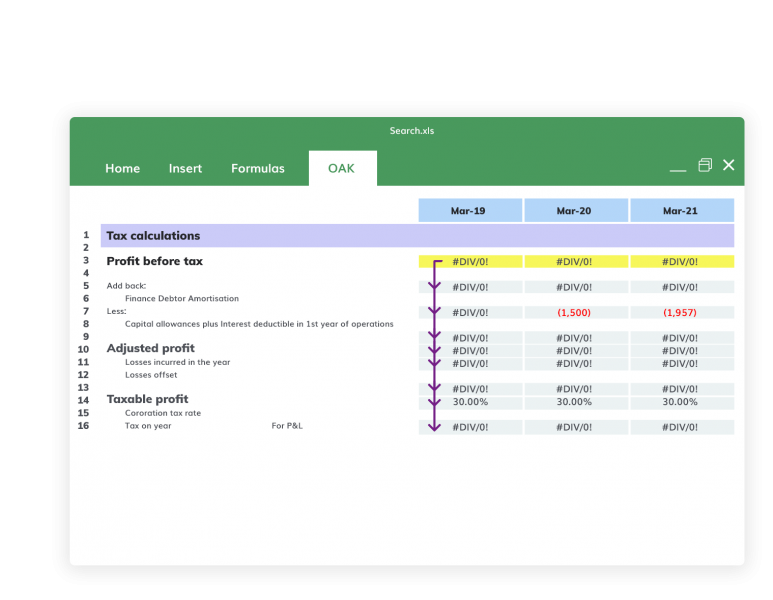 See how OAK makes it easy to work with multiple worksheets in Excel. Worksheet manager: get a handle on a spreadsheet’s multiple worksheets. Select and group sheets based on your desired criteria: update protection, calculations and visibility in just one click. Also, find and replace sheet names. Insert/delete columns and rows: no need to build new data tables or arrays. Add or remove columns and rows to an existing table. At the same time, retain left to the right consistency and avoid errors. 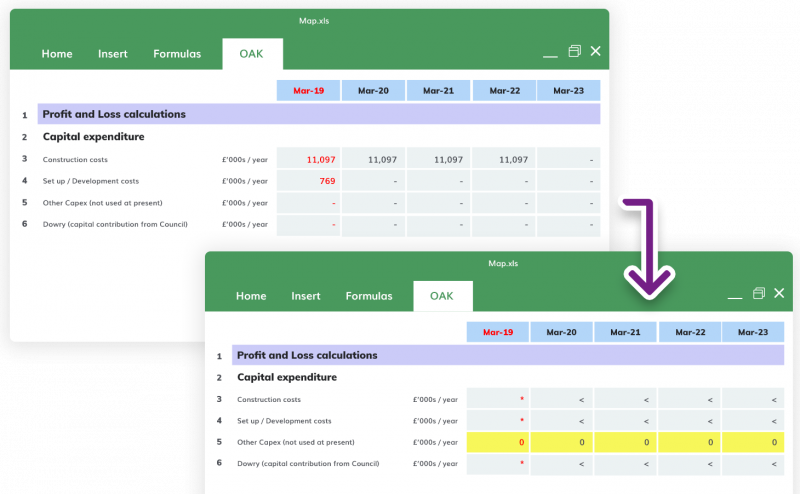 Remove colour formatting: remove the colour from all cells in either a single worksheet or an entire workbook in one click. As a result, reduce file size. Unhide cells: expose hidden cells in a specified worksheet or workbook. Make hidden rows or columns visible. 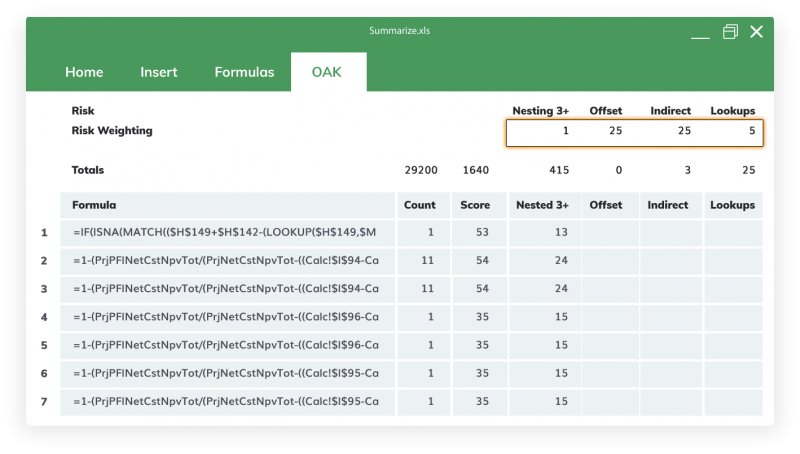 See how OAK makes working with cells in Excel easy. Copy literal: copy one or more formula(s) from a source range to the target range for testing, without the need to adjust cell coordinates. Copy address: need to document and communicate issues found in a spreadsheet review? Easily copy the entire path to a cell. Transpose: transpose cells from one area of an active worksheet to another, rotating orientation from rows to columns while preserving cell refences. See how OAK makes it easy to work with range names in Excel. Build database: generate a report of all range names in a workbook. Apply/De-apply: convert cell references to range names and vice versa. Redefine names: update a range name across an entire workbook – even range names already referenced in formulas. Recreate names: change several range names in just one click. Localize: find and easily convert global range names into names that are local to an active worksheet. Remove #REF! : find and remove #REF! errors that occur when a formula references a range name that no longer exists.